Visuals that speed up innovation processes! The Design Management Journal publishes a new article of me in 2016 on the fidelity of visuals (download here). ‘The what?’ you may think. The fidelity is the degree to which a visualization corresponds to the real world. A sketch at the back of a napkin has a low fidelity and a full blown render of a concept car has a high fidelity. Whereas low fidelity requires some imagination to understand what is meant, high fidelity visuals leave nothing unclear; it looks as if the concept car will drive away. 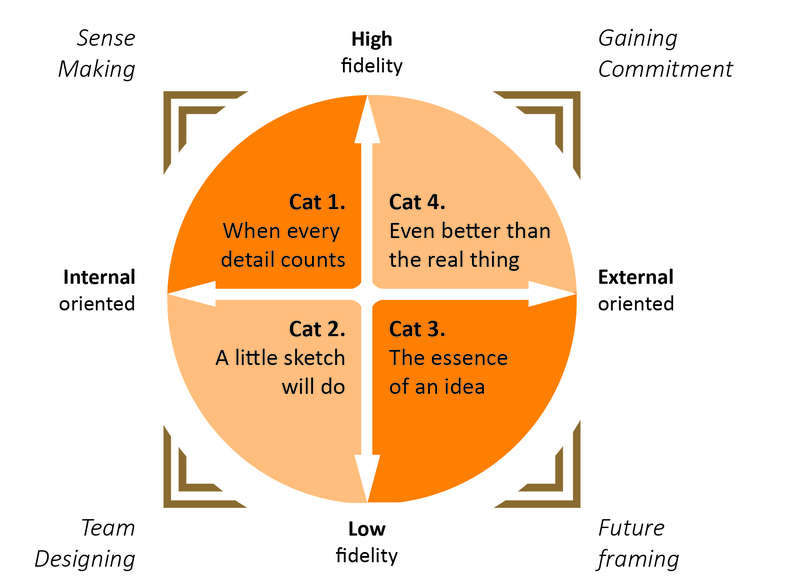 In my studies I discovered that the fidelity of visualizations strongly shapes innovation processes. Some visuals ignite new ideas, some ensure commitment and some perfectly serve to wrap up a long discussion. Visuals have high impact, which may come as no surprise to you. But the fidility has also high impact, which is something not many people are aware of. For example, to get commitment in the early stages of a project, showing a concept car like visual often is contraproductive, contrary to what most people beleive (and do)!